This was the last album of the year I was really looking forward to. The Damned Things are a so-called "supergroup" with Keith Buckley from Every Time I Die along with Joe Trohman and Andy Hurley from Fall Out Boy and Scott Ian and Rob Caggiano of Anthrax. However, there's a slight letdown involved, mostly having to do with Keith. Keith is probably my favorite heavy vocalist out there, but the vocals do not seem up to par with Every Time I Die. The songs however, are fairly strong. This band knows rock and roll. 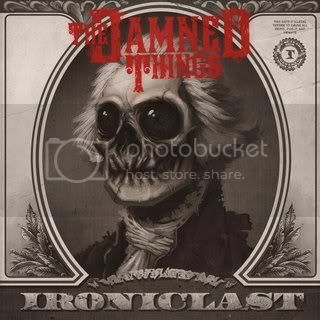 Taking influences from metal and classic rock, The Damned Things could have come straight from the 80's. Guitar solos aplenty combined with the hooks create an accessible heavy album. "A Great Reckoning" sounds extremely similar to the Foo Fighters. However, the one big thing that can be said about the album is that these guys know what real rock is. Even with the letdown, it's a solid album, though one that probably will not be appearing on my end of year list. Check out The Damned Things on myspace here.